We are pretty crazy for pork chops around here, in fact, a good pork chop is probably Meathead’s favorite thing for dinner. And if there’s any kind of cream sauce involved, it’s a surefire hit. For the past several months, my favorite seasoning to play around with has been Cajun (or Creole) seasoning, and smoked paprika. 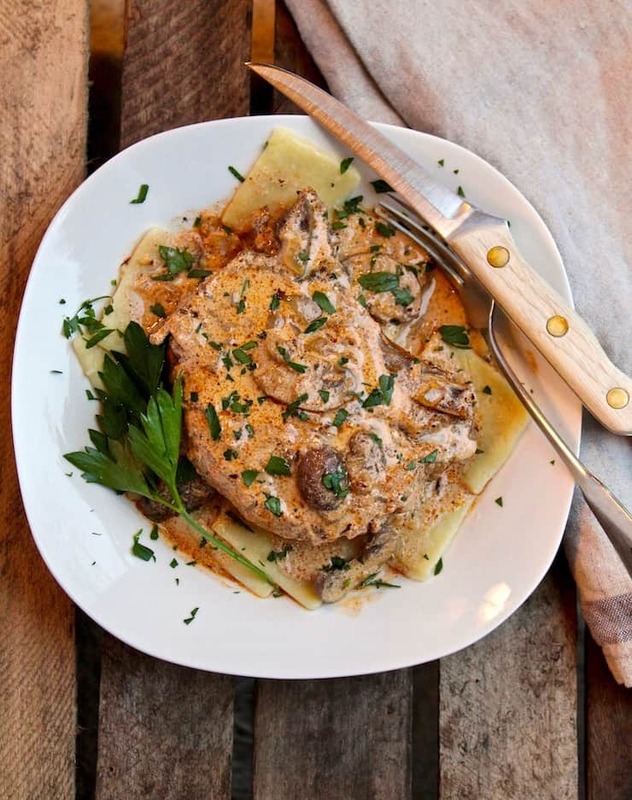 Creamy Cajun Pork Chops has become a new favorite in my house. I’ve heard the term “smothered” when referring to a southern cooking technique and I think this is similar. The meat is browned, the vegetables sautéed, the meat goes back in to simmer in the sauce. That’s pretty much what I did here, with onions, garlic and cremini mushrooms. 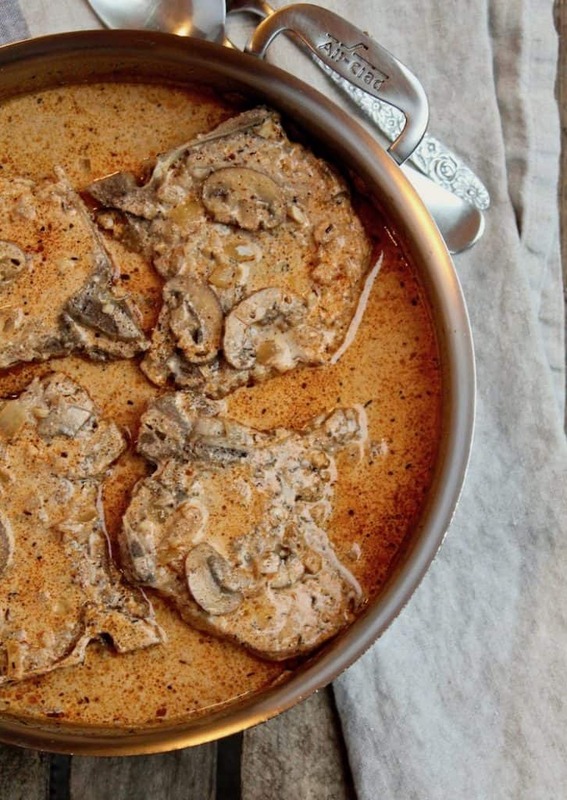 The chops simmer until fully cooked, then the pan sauce is reduced and finished off with sour cream and Cajun spices. This is my kind of comfort food on a cold night ~ served over egg noodles to sop up all the rich, spicy sauce. 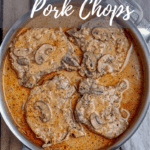 If you’ve tried these Cajun Pork Chops or any other recipe on the blog, then don’t forget to rate the recipe and let me know how yours turned out in the comments below ~ I love hearing from you! You can also FOLLOW ME on FACEBOOK, TWITTER, INSTAGRAM and PINTEREST to see more of what I’m cooking in my kitchen and recipes. Never miss a post ~ sign up for The Hungry Bluebird Newsletter for a weekly email of new content. 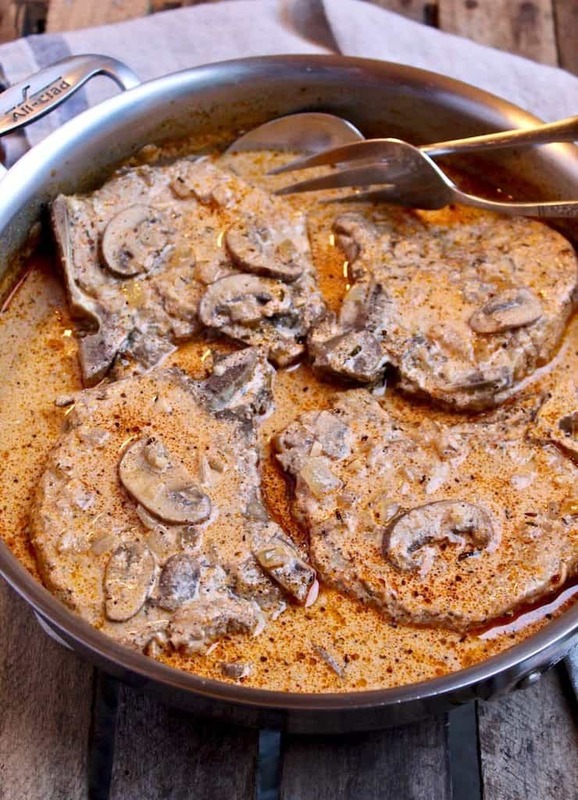 Pork chops smothered in onions and mushrooms, in a spicy Cajun cream sauce. Season chops with plenty of black pepper to taste and sprinkle with a little kosher salt. Heat 2 tablespoons butter in a large skillet over medium-high heat. Brown chops, about 5 minutes per side. 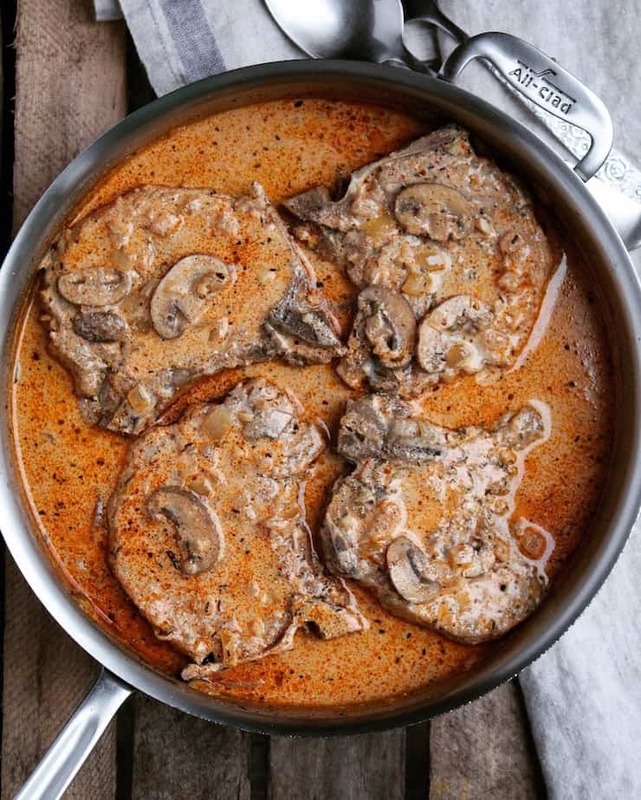 Remove chops to a plate and set aside, leaving fat in skillet. Add onions and mushrooms to skillet and sauté until softened, about 5 minutes. Add garlic and a pinch of salt and cook until just fragrant, about 30 seconds. Add the chicken stock and deglaze the pan, stirring up any browned bits. Season with another sprinkle of salt. Turn down the heat to a simmer, add the bay leaves and nestle the chops back in the sauce. Cover and simmer on low for about 30 - 35 minutes until the chops are cooked through. 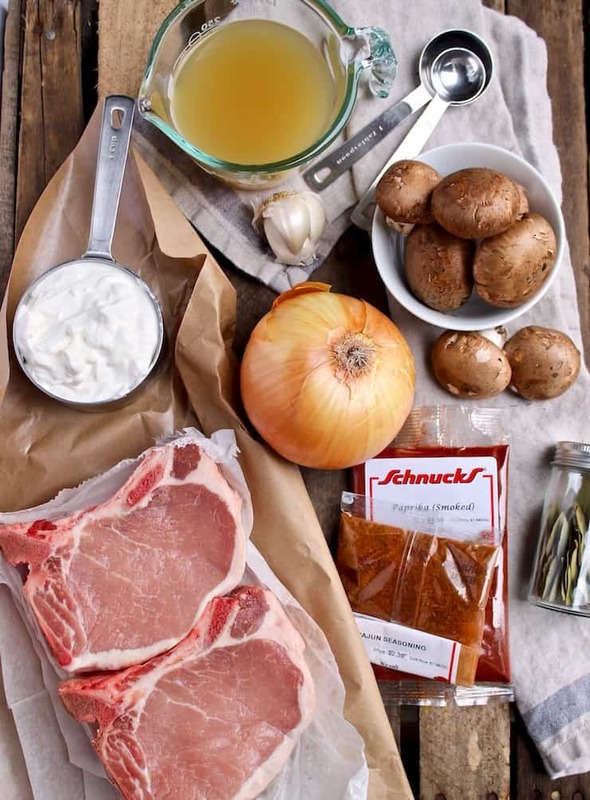 Remove cooked chops to plate and cover loosely with foil. Increase heat to high and bring pan juices to a boil and reduce by about half. Skim as much fat from the surface as you can (I probably skimmed off 2 to 3 tablespoons). Remove bay leaves and turn heat down to low. Whisk in sour cream, Cajun seasoning and smoked paprika until smooth and creamy and heat for 3 minutes, be careful not to boil. Taste and adjust for salt and pepper. Add chops back to pan and coat in sauce and heat another minute or two. Serve over hot buttered egg noodles with plenty of sauce and chopped fresh parsley. I use a Cajun spice blend that has NO SALT. Keep that in mind when seasoning, I salt as I go but if your Cajun spice blend has salt, be careful so you don't over salt. Paprika isn’t salty. Just adjust where it says to add salt. Also can use unsalted butter. It depends on the Cajun spice blend used. My blend has no salt in it. I would check for salt in the Cajun seasonings and then adjust accordingly. My version definitely needs salt! Never seen salt in Paprika. But Cajun seasoning is quite salty. I am going to try this tonight. Excellent recipe! Picky husband approved! This was really good! I wouldn’t change a thing. It had great flavor and it was something different from the regular menu of our dinners. Thanks for the recipe! Lovely recipe my husband and i loved it. Doing low carb so served with loads of sautéed greens it was amazing. Any egg noodles you like! Sometimes I use frozen noodles, sometimes packaged. I add butter and salt after cooking. Mashed potatoes sound great! That sounds really good! Glad you liked the pork chops. Wonderful recipe! We loved it! Not too spicy and my husband who does not like sour cream said the sauce was great! Excellent recipe! I made this for dinner tonight and it is a hit. I substituted rice for the egg noodles and it’s a fantastic combination. As others have said my picky hubby that doesn’t like shoot cream loved the sauce!! Really yummy. Didn’t put as much salt as recipe called for. Perfect served with white rice instead of egg noodles for me. Great meal, excellent recipe! I made this yesterday and it turned out great! Definitely a Keeper!!! I just made this tonight for dinner, it was so delicious. I didn’t use as much salt as the recipe called for but added more Cajun seasoning. My boys absolutely loved it. Definitely going to make again. Would it be ok without sour cream or what is a good substitute? I don’t think so. You could try plain Greek yogurt as a substitute. This meal was amazing. Very salty. I believe it was the chicken stock and the chop seasoning. Make sure you use light salted or unsalted foods. Otherwise amazing recipe. I did this recipe today, but I did adjust a little. I added a can of whole stewed tomatoes, I cut them up small & cooked them with the sauce & chops, gave it a better taste so I didn’t taste the sourcream as strong. Otherwise kept the same, my husband & I loved it. Nice change for chops. I also didn’t do egg noodles, I just cut up golden potatoes & baked in olive oil & seasonig in the oven as my side. We go with potatoes more often if possible. Can I use beef broth/stock instead of chicken broth/stock? I have never used beef stock, I prefer chicken stock. Beef stock is too strong sometimes. But if that’s what you, it would probably be just fine. This was very good. I did omit most of the salt because of salt being in cajun seasoning. I liked it a lot with pasta,but, my husband who is obsessed with honey roasted red potatoes told me that he thought this would be good with those. Big surprise there haha. I served with candied carrots. Thanks for a great recipe!! Made it, loved it, saved it!!! This was a two-thumbs-way-up hit with my husband. And me, too. I followed the recipe exactly, except that I served it with mashed potatoes instead of noodles (I didn’t have any), and it was pretty amazing that way. So delicious. Thank you for sharing the recipe. P.S. I’ll bet the sauce would taste awesome with chicken breasts. I just made this and it was DELISH! I added red, yellow, and orange peppers to it because I had them already cut up and needed to use them, and I wouldn’t make it any other way. I also basically tripled the Cajun spice because I love it super hot! Doing keto diet so no pasta, but I had buttered cabbage to go with it and it was awesome. Definitely going in to my rotation! Sounds delicious! I like everything you did to make it keto, glad you liked it. I made this with regular paprika and served it over mashed potatoes. It was delish. The whole family loved it. Amazing meal everyone loves it. We also use rice, the kids ate the onions without even knowing it. But, I need to get more sauce out of the recipe, how can I do this? Very good recipe. Man pleaser. You said that right, my husband loves this dish! Totally kicks but. Wanted them for breakfast this morning. Definitely on the repeat list. Prepared as directed. My husband has them for breakfast, if there are any leftovers. No shame at all!! Thanks for pointing that salt issue out! It all depends on the blend. I’m so glad you liked this dish! The picture looked good and caught my interest. Thankfully I like to try new recipes. This was absolutely DELICIOUS! The flavors all blended well together and I will definitely make this again. It’s tasty, one of my husband’s favorites! This is my FOURTH time making this recipe! It is amazing, and has quickly become a family favorite. As others have noted, be careful of the salt that comes in many cajun blends. I took 2 minutes to make my own salt- free version and it works perfectly every time! SO GOOD! Thanks for a great recipe! I keep saying I’m going to make my own blend, I think I will next time. The store blend I use is so good (and convenient). I’m happy to hear this is a hit with your family. Thanks for letting me know. I love this dish and the kids eat it up, but I always seem to need more of the sauce. How can I get more without compromising the dish?